British prime minister Theresa May’s speech to the EU summit this evening is being seen as yet another potential crunch moment. EU president Donald Tusk has called on her to find a creative solution to tackling the current sticking point, the Irish border. The Irish backstop is a fallback set of arrangements for Northern Ireland to remain in the EU as an alternative to imposing a hard border with the Republic of Ireland – but the two sides are unable to agree on how long it would last and what form it would take. Both sides would like to finalise an exit deal by mid-November, in order to allow time for voting in the UK and ratification by EU members. 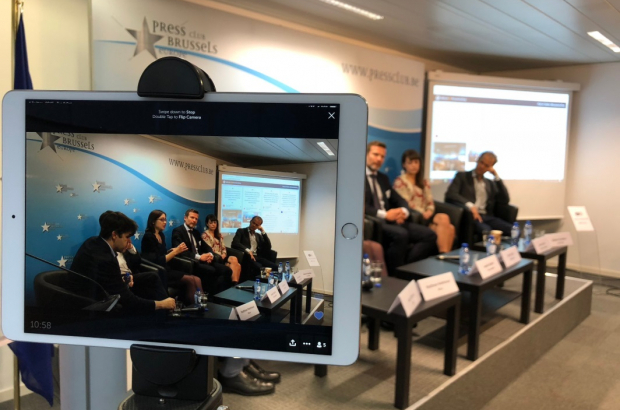 Ahead of the possible breakthrough summit, EU communications consultancy Cambre Associates invited key correspondents from both sides of the channel to the Brussels Press Club last week. Its chairman and newly-appointed British Chamber president Tom Parker moderated. Tom Parker: When reporting on Brexit, is there a particular angle or issue that you follow? Tom Parker: Is there space for the detailed analysis which is critical for the outcome of the Brexit process? Is the tension between negotiating parties and the UK political background driving media attention? AP “Here in Brussels we have to repeat ourselves – explain the basics like the backstop - new readers may have not seen Season 2 through to 7 and are coming in at season 8. TP How do you prepare for an important milestone, like the council meeting or the House of Commons vote in November? Is the EU committed to seeing Brits getting forward movement rights back? Do you have any idea of where these different political views are leading to in a future arrangement of the UK and EU? How does the panel reflect on criticism of Jean-Claude Juncker and press freedom and what is the role of the press in the Brexit process? Does the media have a role to educate? Can you see anything coming up that will test EU unity?